Congratulations to Coach Alford and the men of Westwood. Just about all the premium (and not so premium) sites had us LOSING this game. Call us old school, but how we miss the days when a fan site was expected to have confidence in their team, even when no one else did. Victory celebration video from PAC-12 official site. Seen and heard at the MGM Grand Garden Arena – from the Arizona Star. Our comments about Kyle Anderson NOT getting conference player of the year. 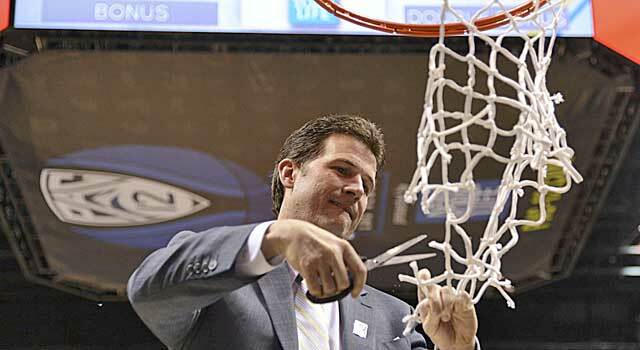 THE MODERATOR: Coach Alford, championship in your first year. Could you talk about how you got it? COACH ALFORD: Well, I got it because of the group of young men in our locker room. They’ve been committed since the 1st of April. They’ve really bought in and they’ve trusted our staff. Our staff has shown a lot of trust in them as well. Just like 50 seconds to go when we decided to go for 2 for 1, and that shows a lot of trust from the coaches of what we think of these young men, and these young men have really trusted us. Because of that, they’ve gotten better. They’ve gotten better since April. Jordan’s been out. Didn’t really get to do anything until September, October. So when you’re dealing with injury or what it was, they’ve done a tremendous job of buying in. We’ve been really good all year. We’ve been consistent, but we just kind of missed that edge, and I thought we got our edge after the Washington State game and getting back to Westwood. These guys have really been committed. We got an edge to us now, which is a lot of fun and to win a championship means a great deal. Q. Kyle, what does it mean to you to get the most outstanding player in such a talented conference? KYLE ANDERSON: It means a lot. But first and foremost, I couldn’t have done it without winning the championship, and that took a team effort. Me knowing I helped my team out today, it means a lot to me. We played very hard, one of the best defensive teams in the country, one of the best rebounding teams in the country. So I knew I would have to do a little scoring and a lot of rebounding. So it’s a great award. Q. Jordan, can you talk about that three?pointer you made with 50 seconds to go and what was going through your head at that point? JORDAN ADAMS: Yeah, in the huddle coach drew it up. It reminded me back to the day when we played them at Pauley Pavilion. I missed that shot in and out, and that shot haunted me. I always told myself if I got another chance, I would knock it down. And coach trusted me to shoot it, and that’s when I made it. Q. I know some people doubted your credentials as an up tempo coach going through the season, and I think you proved them wrong throughout the season. But this game, especially this first ten minutes, I’m not sure I’ve seen you guys play that fast. What does it mean that trophy and that sort of validation? COACH ALFORD: Well, I guess you can say what you want on style and all of that. Styles are always depicted on what kind of team you have, what your talent is. We had teams, whether it was Missouri State or Manchester where I got my start, we had a group of young men that could fly. At Missouri State we had different kind of teams and Iowa different teams, and New Mexico last year was more of a grind?out team. But up until last year, the five years previous to that, we were an up?and?down team. This team has incredible athletes on it. We’re long. We’re athletic. We can all shoot it. Other than Tony, we won’t let Tony shoot a three yet, but he’s working on it. Once he makes his free throws, then we’ll move him back. But seven of the eight in the rotation can all make threes. We pick and pop. We can roll. We can spread you out and drive it. We want these guys to have the freedom. We’ve told them that right from day one when we started meeting with them, the way we wanted to play. Kyle, knew from the first week that we met him, he’s a point guard. So we defined roles pretty quickly. For them to come this far, like the Wear twins, I’m their third collegiate coach. That’s not easy. For them to buy in, Travis the loose ball he got tonight, that will always go down as one of the greatest plays in Pac?12 history as far as a tournament goes. That was an incredible loose ball get. So everybody had a hand in this. They worked awfully hard and they deserved it. So more than style of play, it’s really a credit to the players of how much trust they put into the coaching staff. Q. Obviously you’re probably going to be a little bias, but going into the NCAA Tournament it looks like there may be as many as six teams from this conference going in. How strong do you feel the conference is compared to the rest of the country? COACH ALFORD: Well, just watching a lot of games, that’s what March is for and the NCAA Tournament is for. You prove your worth. It’s just the way it is. It’s a three week tournament, and the leagues have to prove what they’re worth. Pac-12 as far as I’m concerned, I’ve been on the outside looking in, being in the Mountain West the last six years, and it’s been trending up. I thought last year the Pac-12 was much, much better. Two and three years ago, not so much. So it’s been trending up. This year, unbelievable. Just comparing it to the leagues I’ve been in. This league this year was really, really good. So we’re deserving of six, if not seven teams in the NCAA Tournament, and hopefully we’ll all get some good seeds and it’s match?ups. Fortunately we’ve played a lot of different match?ups, and we like to score. To be able to score 75 on this team, we actually did it twice this year. There are probably not two teams in the country that have scored 75 points on Arizona. I think Arizona is the best defensive team we’ve played all year, and we’ve played some really good teams. I think Arizona is the best defensive team we’ve played all year. But we haven’t beaten them. Now beating them gives these guys the momentum and confidence knowing we can not just play with anybody, but we can beat anybody. Right now we need to stay hot. We’re shooting the ball well and clicking offensively, and they’ve got a new commitment to the defensive end which makes them dangerous. Q. I’m a little interested in what you told your team right before that Aaron Gordon shot in the corner? I believe it came after a timeout. COACH ALFORD: I’m not for sure about that timeout. We had so many timeouts. We had a lot of timeouts left so we wanted to use them. At the four minute media timeout, we talked about having four timeouts left, and we’re going to lose them because that was the last four minute game. I think it was tied. I think Kyle had to come out and hit two free throws. We talked about you’re going to make these and we’ll be tied. A four minute game left. We have the timeouts to use. They had the possession arrow. So we’re going to use them all. We’ll break it up into maybe four one minute games, but let’s go as hard as we can. We’ve got two days off. We’ll give you Sunday, Monday off and let’s get after it here in these four minutes. These guys did some good things in the last four?minute game. Q. Kyle, you were 10 of 13 from the line today. Can you talk about what you and your team can do from the line that set you guys apart? KYLE ANDERSON: Well, we know they’re a very aggressive defensive team, so we had to be aggressive on the offensive end. I think I was able to get to the hole and just make other defenders come to me and draw fouls. It’s tough scoring on Aaron Gordon or making plays on him. He’s a great defender. I knew if I could get him off balance a few times and get to the line, that would help me out a lot. COACH ALFORD: I mean, seriously, 21, 15, and 5 from your point guard? He’s an amazing player, and he’s proven it all year long. He’s very unique. A 6’9″ point guard that facilitates the way he can. He’s a nightmare to match up with. He’s been a joy to coach this year, and he’s really done a good job leading his team. He’s been crucial with his leadership all year. You’ve seen it coming. He was one leader in October, and he’s a much, much better leader now than he was in October. For Jordan to really spend the better part of six months of basically not being able to do anything, for the year he’s had, these two men have done an awful lot. They’ve had a lot of pressure on them, and they’ve responded in a big way. For Kyle, the game he had, and Jordan had a big game, but like he talked about, same team, same scenario, he missed the shot at home. To have the toughness to come back and take that shot in this environment again and make it, speaks volumes about what these two young men mean to our team. Q. You see a lot of NBA coaches obviously go for a two for one in that situation, but not as many college coaches. What made you have the confidence to do that in that spot? COACH ALFORD: I trust these guys. I’ve got the best point guard. I knew he would deliver the pass the right way. I’ve got the best shooting guard, and Tony does a great job screening. It’s our money play. You know, there are 50 seconds to go, and we’re talking about it. It’s a two for one situation. I don’t like giving the other team, especially a team like that, the last shot. If we would have taken 20 seconds, make or miss, they get the last shot. We didn’t want that. We’re a good foul shooting team, so if we score and get a stop, they’ve got to foul, which again gives us an advantage. But it came down to trusting them, and we’ve been having fun. This group has fun. Fifty two seconds going into the timeout and we’re laughing. I come into the huddle and I said, how about money? And these guys are cheering and jumping around. So when you have a team that excited to run something, you’re crazy as a coach not to at least try it. But it’s all about the players. You can draw up whatever you want to draw up. Players have to make plays, and our players have been doing a good job of making plays all year. Q. Kyle, can you describe that play from your eyes too? KYLE ANDERSON: Well, I saw Nick Johnson bite on the screen for the screener. Nick Johnson was guarding Jordan, so I saw him bite on me coming off. Once I saw him commit to me, I wanted to get the ball to Jordan immediately. So it’s a tough play to defend, screen to screener. Jordan knocked down a shot. I knew he would. I knew it was going in from the moment it left my hands. It was a great play. Great 2 for 1 opportunity, and it worked out. Q. Jordan, on that game?winning three, did you think you got fouled? It looked like you did. JORDAN ADAMS: I was just concentrating so hard on the rim, that I wasn’t even worried about anybody else. Q. Congratulations all. Coach, you’ve been through this NCAA drill as a player and a coach. Walk us through the prep because it’s so different. You don’t know who you’re going to play, where you’re going to play. It’s a quick turnaround. What is the process like for you guys to get ready as a team for a situation you don’t know? COACH ALFORD: It’s very difficult. Especially this is my third year in a row here in Vegas of winning three games in three days. That can be a grind because you play such good talent. This year is no exception. We played Oregon who was the hottest team in our league. We play a very good Stanford team that had beaten us double figures last time we played them. And then we played arguably one of the two best teams in the country in Arizona on the third day. So that becomes a long grind, and you know you’re going to start then on either Thursday or Friday of the next week. So we haven’t talked much about it, but we’re going to give them two days off. We did that when we came back from Washington State. They deserve it. We’re going to celebrate. We want to celebrate in Westwood and have some fun, let these guys have some fun Sunday and Monday, and then we’ll get back together Tuesday. Obviously we’ll find out tomorrow who we’re playing, and the coaches can get to work Sunday night and into Monday. But the guys need to get some physical and mental rest before we start the next tournament. Why do you think there were so many Arizona fans and not many UCLA fans at the game? It was kind of sad wasn’t it? Thanks for the transcripts! When are you going to add a forum to the site? It would be great to just be able to ask you questions or interact with you instead of trying to do it with these comments. BruinArt – Well, we think there were a few factors in play regarding attendance. First, UCLA students are entering finals week this week. Kind of hard to take the weekend off for a road trip right now. So that explains the students. As for the fans, we think there were a few things in play. The biggest being the disaster at Washington State just before the tournament. Many “fans” probably thought the guys would flop against Oregon and didn’t want to take the trip to witness that in person. If we had bowled over WSU and won by 20 instead of losing by 18, there would have been a lot more excitement going into the tournament. Second, the pay sites pretty much all predicted we would lose each of the games in the tournament. If the self-proclaimed UCLA basketball “experts” have already thrown in the towel on the team, then it will have an effect on how the fans look at the team as well. There are other factors in play but we think those are two of the biggest. UCLARandy – glad you liked it. As for a forum, we are just now sure yet. We know the comment section is not really working and we have gotten a lot of requests for a forum. But there are already some great free forums out there like BruinGold and BruinZone. We don’t know the guys running them but they do a great job and we don’t really want to try to take away their posters. We will keep working on trying to improve what we have here and see where it goes.